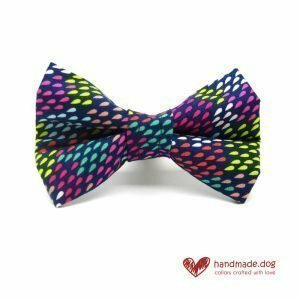 Stand out from the crowd with this fabulous handmade multicoloured rainbow drops dog bandana and brighten up your walk in the park! 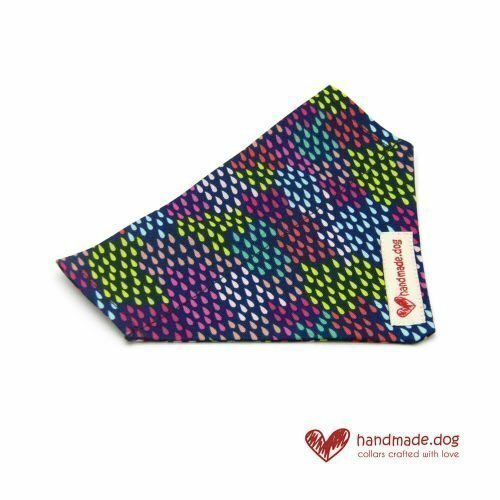 This lovely handmade multicoloured rainbow drops dog bandana is made with a cotton fabric for a quality finish. Our fabric dog bandanas are lovingly handmade. 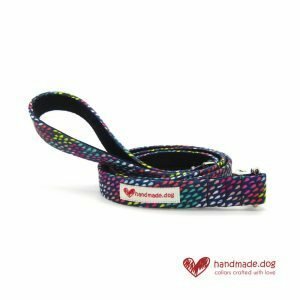 Designed so your dog’s collar simply slides through the top, they ensure an easy and secure way for your pooch to proudly wear their bandana. Keep your pooch cool in summer by soaking your dog bandana in cold water before fitting it to their collar. Slide the bandana to the back of your dog’s neck to keep them cool… both in looks and comfort. 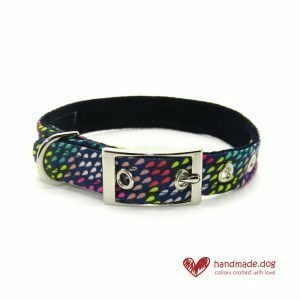 A matching handmade multicoloured rainbow drops dog collar, lead and dickie bow are also available to make your dog even more dapper! 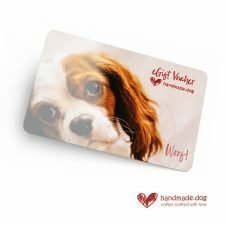 We aim to make the purchase of your handmade.dog collars and accessories a memorable experience and believe the initial purchase is just the start. We take as much pride in wrapping and presenting your item as we do making them. 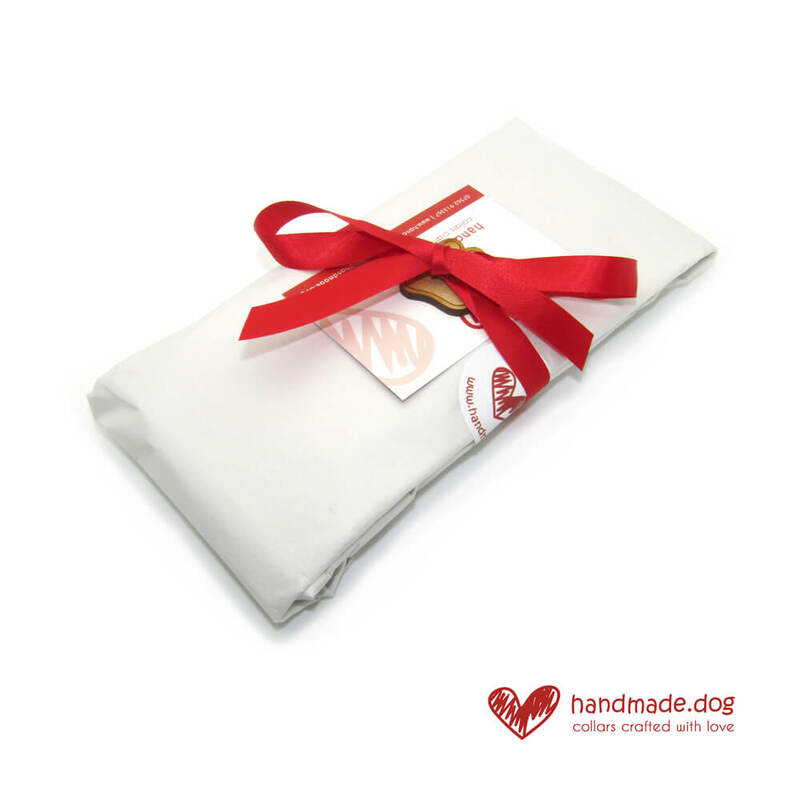 Every one of our products is carefully and beautifully gift wrapped to ensure it arrives in perfect condition, makes you smile and gets your pampered pooch excited. Our extra small dog bandana measures approximately 5.5 inches(L) x 4.5 Inches(W) and is suitable for toy breeds such as Yorkshire Terrier, Pomeranian etc. Our small dog bandana measures approx 7 inches x 5 inches and is suitable for small sized dogs such as Cavalier King Charles Spaniel, Bichon Frise etc. Our medium dog bandana measures approximately 8.5 inches(L) x 6 inches(W) and is suitable for medium sized dogs such as Cockerpoo, Beagle etc. Our large dog bandana measures approx 9.5 inches(L) x 6.5 inches(W) and is suitable for larger dogs such as Labrador, German Shepherd etc. Our dog bandanas are sprayed with a high quality fabric protector to help repel any dirt. However, should your pooch get mucky, their bandana can be machine washed at 30 degrees, left to air dry and ironed to bring them back to perfect condition. Items shipped to UK mainland addresses will be sent using the Royal Mail Second Class Signed for service at a cost of £3.50. An optional upgrade to a Royal Mail First Class Signed for service is available at checkout at a cost of £4.00 for UK mainland orders. FREE UK mainland shipping is available for all orders over £50. 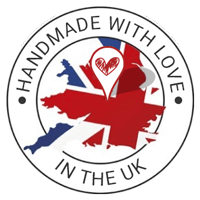 Items sent to NON-UK addresses will be sent via the Royal Mail International Tracked and Signed for service at a cost of £9.00.